The NYC Clerk’s Office is out with their annual report on lobbyists. 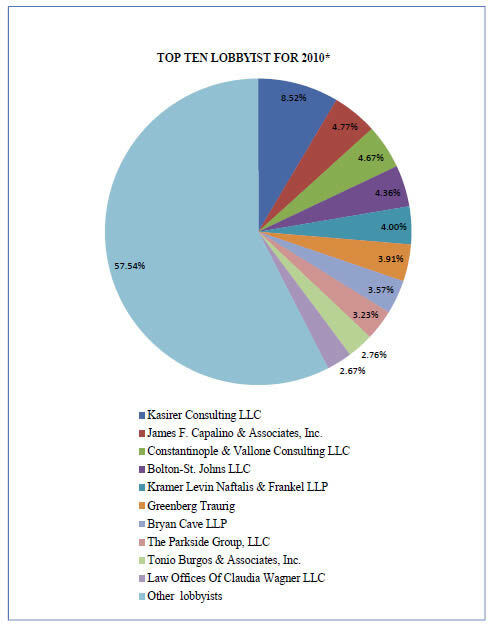 Quick notes: Suri Kasirer’s firm retain’s their top position; James Capalino‘s team improves over last year’s (very) respectable showing; Bryan Cave (home of Ed Koch) moves up; Fried Frank Harris – the giant law firm which ranked No. 10 last year – doesn’t make the cut this time around. As helpful (okay, fun) as it is to pore over these numbers, they are, only, a slice of the whole picture when it comes to influencing NYC lawmakers. Others, who fall outside the definition of “lobbyists” but certainly play a role in shaping the course of events in City Hall include grassroots advocates, think tanks, publishers, and ad men.